Programming Note: Further UFR technical delay. I promise promise promise they go up Monday and Tuesday. Yeah, stuff's going on this year, but it's safe to say that at 7-4 this season is functionally over. Personally I'm less interested in the dying embers of this year than the promise of 0-0 and a healthy Mike Hart, and since we're in a bit of a dead spot the thoughts of MGoBlog return once more to the beginning. What follows is an assessment of the losses to graduation on offense and an evaluation of their projected replacements. Defense coming soon. In A Nutshell: Despite being named All Big Ten as a junior, Massaquoi was never a star. Big, somewhat athletic, and a good blocker, he was a useful piece but his tendency to drop catchable balls (with or without a cast on) was a major flaw. Replacing him... probably: Fifth year senior Tyler Ecker, who saw just as many snaps as Massaquoi did this year and was the nominal starter by year's end. Ecker is a better receiver but an indifferent blocker. Mike Massey and Carson Butler will play when Michigan has two TEs in the game (and they will probably do so with frequency, le sigh). Net Effect: Probably more productive on the surface. Without Avant's steadying influence Henne will be looking around for a possession guy. Ecker is the one player on the team who seems to have his confidence already; his catches should shoot up as the undisputed starter. It remains to be seen how effective he'll be as a blocker. By the end of the year, though, my first preference was to see Ecker on the field instead of Mass. In A Nutshell: Michigan's best offensive lineman last year with no competition. Stenavich exceeded expectations, shutting down every defensive end he opposed this year. Offensive linemen are like defensemen in hockey: you only notice them when they screw up or dominate utterly. One who appears so rarely in obsessive play-by-play breakdowns of football games must be doing a very good job. The caveat is that Michigan's injury explosion at right tackle caused anyone with a badass DE to line him up opposite poor Rueben Riley for maximum mismatch potential. Thus, Stenavich did not oppose Penn State's Tamba Hali or Notre Dame's Victor Abiamiri. Even so, he was a rare light of consistent competence on a line short of that quality. Replacing him... probably: Fifth year senior Mike Kolodziej. Kolodziej has a modicum of starting experience--a few last year before Long took over or when Stenavich pissed on something he shouldn't, a few this year when he wasn't busy having a mysterious tingly illness--and should be okay in pass protection, though he will probably be a step back from this year's edition of Stenavich. Everyone says he's not much of a run blocker (his playing time was far too sparing to get a read on it myself), but if he can just keep opponents away from Henne that's enough for me. Net effect: This departure is by far the most worrying. Whereas some spots have capable backups poised to take over and others are losing distinctly average (or worse) incumbents, there's a potential for a serious dropoff here. In A Nutshell: Reasons #2 and #3 why Michigan's offensive line was a huge disappointment this year (reason #1, of course: Jake Long's uncooperative ankle). Henige and Lentz were below average Big Ten guards largely incapable of pulling, blocking in space, or driving back even the lesser defensive tackles in the conference. Replacing them... probably: Fifth year senior Rueben Riley and redshirt sophomore Alex Mitchell. Riley has bounced around the starting lineup the past two years, from tackle to left guard to center back out to tackle. Once he gets settled in at one position and plays it (likely left guard), he should be somewhere between adequate and good. Many, including myself, were down on his performance in Long's stead this year but he did largely neutralize Penn State's demonic Tamba Hali in one of the year's more surprising overachievements. He's a good player. Mitchell is being pushed as the gem of the 2003 offensive line class and is clearly in line to start at whichever spot is not occupied by Riley. He did get a not-insignificant amount of time with the starters this year due to injury and looked like a freshman, but there's great hope he can mature into a mauler. Net Effect: Can't be worse. Michigan started rotating Riley in at guard after Jake Long returned, usually after a couple series wherein Lentz or Henige screwed something up badly. Riley has almost two full years of starting experience, one at left guard in Michigan's 2004 line. He'll be fine. The rumblings about Mitchell are very positive, and he did see some time this year. That's some Matrix stuff right there, kids. In A Nutshell: Sticky-handed, more athletic than credited, and ultra-reliable year after year, Avant was Michigan's go-to receiver after the departure of Braylon Edwards. His ability to catch things out of the reach of mere mortals saved Michigan's bacon in more than one game. If Chad Henne had just been average most of the year, Avant would have come close to matching Moonbeam's numbers. He'll be badly missed. Replacing him... probably: Some array of Mario Manningham, Antonio Bass, Steve Breaston, Adrian Arrington, Doug Dutch and Laterryal Savoy. Savoy and Arrington are the tall, striding types who may play much like Avant, but it's obvious that Michigan is grooming Bass and especially Manningham for starring roles. Expect Avant's catches to spread out to a few different receivers next year, likely Tyler Ecker and Manningham. There's no shortage of talent at the position, but Henne will have to be more accurate next year, since no one bails out a quarterback like Jason Avant bails out a quarterback. Net Effect: You mean other than severe mental distress when it hits home that the official binky of MGoBlog is plying his trade elsewhere? Michigan's receivers will be just fine. They've been just fine forever--can you think of a year in which Michigan didn't have at least one guy who is obviously one of the best in the conference--and with Manningham, Breaston, and Bass will certainly be so next year. Yes, every third down drop will make me pine. There might be some yearning when a wide receiver screen is blown up because of bad blocking. But Michigan's stocked up on top-100 receivers over the past couple years--no fewer than four are sophomores--this is not an area of concern. New Math and all that. Michigan loses two important players, one servicable platoon member, and two anchors... in the "drag you to the bottom of the ocean" sense. That's not much damage, especially when you consider that there are obvious players to step forward in all cases. Michigan should be able to maintain its level of offensive efficiency despite its losses. Of course, maintaining the offense's "efficiency" is about as desirable as being pecked to death by penguins. 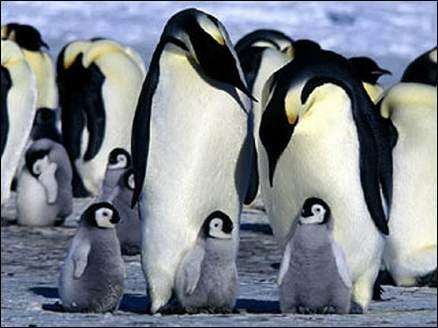 Penguins who've heard that putting testicles in soup means increase virility. And they've heard that you gave Mario Lemeuix cancer. And that you're a Jew. Look: these are some pissed off penguins, and they're coming for your balls. I don't exactly what you said, but next time you think about mouthing off outside the weather station you'll feel the void between your legs that reaches down into your very soul and you'll modify your anti-Penguin screed into something a little more balanced, I assume. Because when I get the hell off this glorified iceberg I'd better have all my components in working order or you'll think this impending castration-via-penguin is a stroll in the park. A stroll in the fleebing park. The upshot is that there's no reason to expect Michigan's departures to negatively impact the offense much. Mass and Avant have capable replacments; the guards weren't any good; losing Stenavich versus retrieving Long and Hart is a net win. That's a long way from saying that Michigan's offense is going to have the sort of explosion it was supposed to this year, but if it doesn't it will be more due to Bad Henne than anything else.